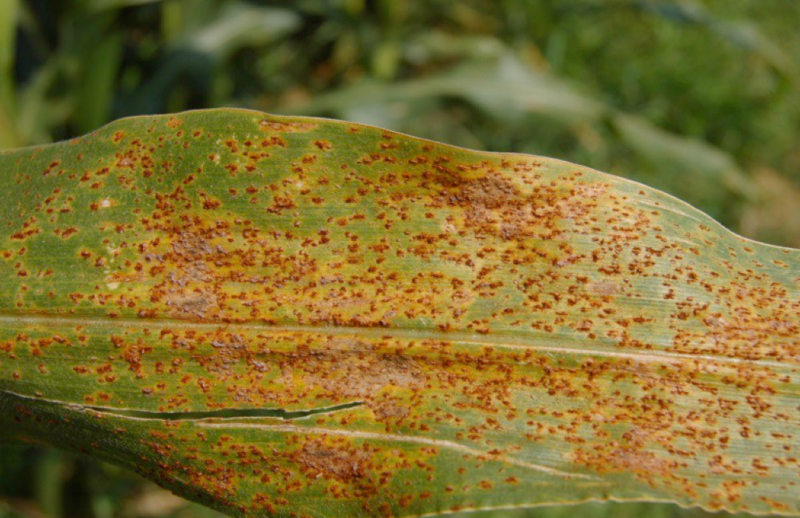 Common corn rust, caused by the fungus Puccinia sorghi, is the most frequently occurring of the two primary rust diseases of corn in the U.S., but it rarely causes significant yield losses in Ohio field (dent) corn. 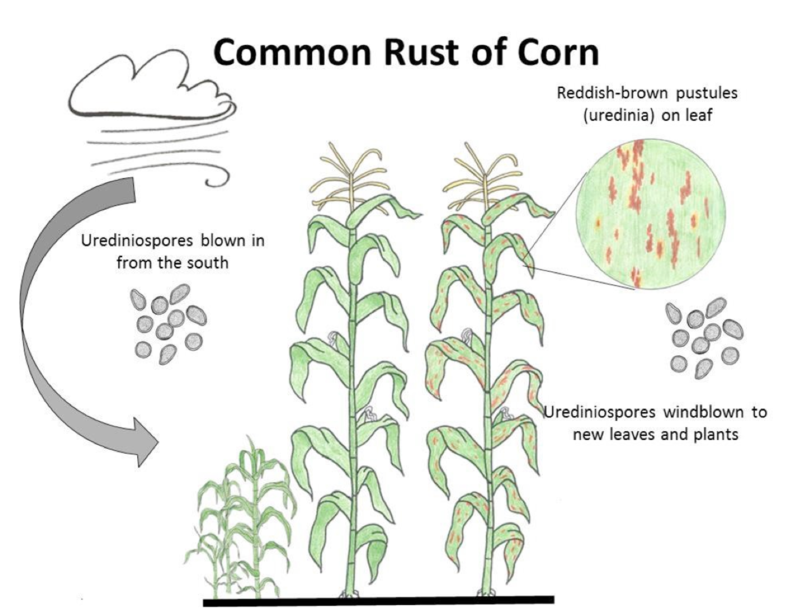 Occasionally field corn, particularly in the southern half of the state, does become severely affected when weather conditions favor the development and spread of the rust fungus. Sweet corn is generally more susceptible than field corn. In years with exceptionally cool summers, and especially on late-planted fields or sweet corn, yield losses may occur when the leaves at and above the ears become severely diseased before grain fill is complete. Although a few rust pustules can always be found in corn fields throughout the growing season, symptoms generally do not appear until after tasseling. These can be easily recognized and distinguished from other diseases by the development of dark, reddish-brown pustules (uredinia) scattered over both the upper and lower surfaces of the corn leaves (Fig. 1). These pustules may appear on any above ground part of the plant, but are most abundant on the leaves. Pustules appear oval to elongate in shape, are generally small, less than 1/4 inch long, and are surrounded by the leaf epidermal layer, where it has broken through. If infections occur while the leaves are still in the whorl, these pustules may develop in bands across the surface as the leaf expands in size. Unlike most other foliar diseases of corn, this rust fungus does not overwinter in crop residue. Spores must be blown northward during the growing season (from mid-June to mid-July) from subtropical and tropical regions where this fungus survives on corn or wood sorrel, the alternate host. Young leaves are generally more susceptible to infection than older leaves. Rust development and spread are favored by prolonged periods of cool temperatures ranging from 60° to 74°F and high relative humidity. Under these conditions, pustules develop on susceptible corn hybrids and sweet corn varieties within 7 days after infection. Occasionally, chlorosis and death of the leaves and leaf sheaths occur when infections are severe. Uredospores produced during the season are wind disseminated, spreading the pathogen to new leaves, plants and fields. As the corn plant matures pustules turn brownish-black in color due to the development of darker pigmented telia that replace uredinia and produce teliospores. In tropical regions teliospores infect the alternate host, wood sorrel (Oxalis species), however, in temperate areas such as Ohio and other states in the U.S. cornbelt, the fungus does not infect wood sorrel and the teliospores have no real epidemiological significance (do not contribute to the disease cycle). Although rust is frequently found on corn in Ohio, very rarely has there been a need for fungicide applications. This is due to the fact that there are highly resistant field corn hybrids available and most possess some degree of resistance. However, popcorn and sweet corn can be quite susceptible. In seasons where considerable rust is present on the lower leaves prior to silking and the weather is unseasonably cool and wet, an early fungicide application may be necessary for effective disease control. Numerous fungicides are available for rust control. Consult your local county extension office and C.O.R.N. website for the latest recommendations for efficacy. Always read the fungicide label for rates and application timing.